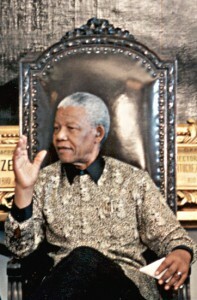 Nelson Mandela in 1998. Image: Arquivo/ABr. The skies wept over thousands of mourners gathered yesterday in a soccer stadium in South Africa to remember Nelson Mandela. Canada’s Prime Minister, Stephen Harper, attended along with four former prime ministers: Jean Chretien, Kim Campbell, Joe Clark and Brian Mulroney. Also in attendance was Shawn Atleo, national chief of the Assembly of First Nations. Leaders of many other nations attended the memorial service to commemorate “the father of South Africa,” who passed away on Thursday at the age of 95. He makes me want to be a better man. He speaks to what’s best inside of us. After this great liberator is laid to rest, and when we’ve returned to our cities and villages and rejoined our daily routines, let us search for his strength, let us search for his largeness of spirit somewhere inside of ourselves. Before the ceremony, two leaders did something that caught the attention of the millions of people watching the televised event: Barack Obama and Cuban President Raul Castro shook hands. It was brief gesture which spoke volumes. Their two countries—the United States and Cuba—have been enemies since the Cuban revolution in 1959. Cuban products are banned in the United States. Canada and Cuba enjoy an amicable relationship. 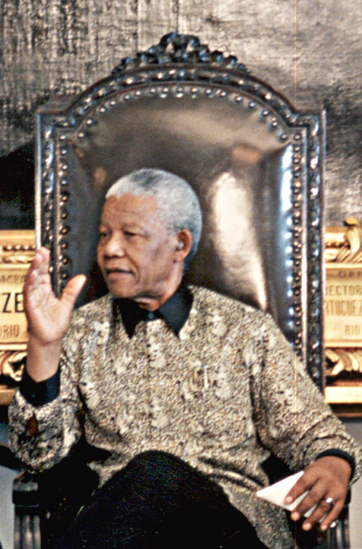 In fact, in 2001 Mandela became the first living person to be declared an honourary citizen of Canada. He also received the Order of Canada, one of more than 250 significant honours bestowed on Mandela, including the Nobel Peace Prize. At yesterday’s memorial for Nelson Mandela, a great man who stood for reconciliation, the two presidents’ clasped hands seemed to signify hope for a friendship. Royalty, celebrities and ordinary citizens watched the memorial ceremony. Mandela’s body will “lie in state” until Friday. A state funeral is planned for next Sunday. For more information about Nelson Mandela, read TKN’s June 2013 article. This article is about Nelson Mandela’s memorial, honouring his tremendous work and the lasting impact that he has made in the world. However, this article also discusses the strained relationship between The United States and Cuba. How do these two stories overlap? What common themes weave these two stories together? The people attending Nelson Mandela’s memorial came from around the world. They came from different cultures, different political situations and they all have different points of view on the world. Although they have different points of view on many topics, they all agree on the tremendous impact that Nelson Mandela has made on the world. Try to summarize the point of view shared by all of the people who attended the memorial. The first sentence of this article includes a strong image: “The skies wept over thousands of mourners gathered yesterday in a soccer stadium in South Africa to remember Nelson Mandela.” What do you think the journalist meant by the description:”the skies wept”. How does this image paint a picture of the memorial?